"Family Adventure vacations to Westwater Canyon"
Jess, Luc, Meghan, and James were all just outstanding guides on our Westwater Canyon Adventure – friendly, outgoing, and above all, excellent boat handlers. You're lucky to have them working for you. Even the two members of our party who had some misgivings about big rapids and wild rivers both had big grins on their faces by the end of the day! Becky, Taylor, Ryan and Alex were our guides on the Westwater Canyon Rafting Adventure. They were professional, informative and fun. I have to give extra credit to Ryan. My wife, a 62 year old grandmother, went out of the boat while we were negotiating Skull rapid. Ryan controlled the raft and got her back in the raft in a quick professional manner. Plus he was delightfully entertaining the entire day. We recommend the Westwater Canyon Adventure! Everything was amazing! The guides took very good care of everyone! We had so much fun and look forward to doing it again! The Westwater Canyon Rafting Trip was AMAZING. Not only was it fun but the guides were so knowledgeable on everything from being on the river to geology. They also demonstrated a great respect for the river but knew when to let loose and have fun. Our trip to Westwater Canyon was absolutely amazing!!! The guides at Western River Expedition were wonderful!!! Very helpful and very professional!! !That was one of the most wonderful experiences of my life. I can't wait to come back next year. Thank you! Amy, our guide on the Westwater Full-Day Rafting Adventure, was incredible. Calm, confident, knowledgeable, friendly, funny, what more could you ask for? I was thoroughly impressed with her experience and the experience she gave us. Thank you! It was the time of my life. I’ve been recommending you guys to anyone that will listen! It was like mother nature’s waterslide! 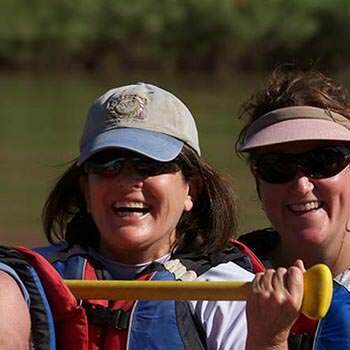 Your guides on the Westwater Canyon Rafting Adventure were skilled, knowledgeable and had a great sense of humor. We enjoyed the waterfall, beautiful scenery and stories/history supplied by your guides. We would definitely return and recommend the Moab Adventure Center to others.